Sponsored by: USA Realty, 37 years and more than a thousand satisfied Poconos Buyers and Sellers. 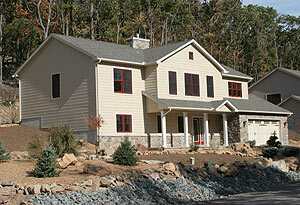 Pocono Builder's Special - Ready For Your Family Today! Empire Real Estate & Development - Builders. No other place in the world is more important than your home. It's where children play, parents share memories, grandparents share and pass on traditions and where friends gather. There is no substitute in life for the special place called home. Empire has over 25 years of experience in building quality personalized homes and a reputation for building some of the finest homes and communities in the region. * USA Realty a Pennsylvania Licensed Real Estate Company and it's principals have been actively involved in real estate and homebuilding in the Poconos for over 20 years and have been certified by the National Association of Home Builders as Certified New Home Sales Professionals. 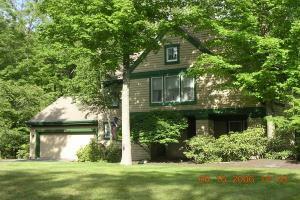 You should seek legal counsel for representation when purchasing a major investment like a home. 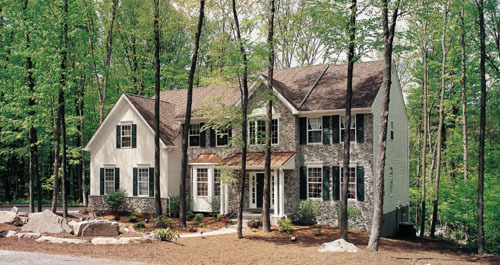 USA Realty can, however help you through the Poconos building process with advice on which builders might be right for you and the style home you wish to purchase, the process by which you select a home and location, and with finding the appropriate financing for your new home. Its important to spend the time and find guidance to be sure the builder you choice is the right one for you. Finding the right one, will make the process go exceedingly smooth. 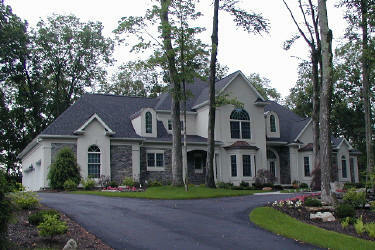 Selecting a builder that is inappropriate for your style of home, or personality is not good. . The big question facing a you will be the 'price versus quality' - in purchasing a new home, more than with any other product the old saying "You get what you pay for" is true. What you need to find is a builder who will do a top quality job at a reasonable price. As a customer of USA Realty we want you to get good value, so we have prepared a checklist of things to do and look for when choosing a Poconos builder. -- Probably belong to a trade body - this means the builder will conform to a code of conduct and will face the possibility of disciplinary action if that code is breached. -- Have current liability and workman's comp insurance - this means that if an accident happens to a member of the public or a subcontractor as a result of building work on your property, the resultant costs will be covered. -- Be happy to give you an estimate in writing, with details - this means you will be able to compare estimates at your leisure and not have to rely on memory as to what is included in each price. -- Be happy to have the work agreed in writing - this is as much to protect the builder as it is to protect you. -- Not ask for unusual payment methods - there should be an appropriate deposit required unless you request specific materials, a reasonable payment schedule and be able to provide proof of where your deposit is at all time. USA Realty endorsed builders have been selected as a result of study, consideration and over 20 year experience in the real estate and building industries in the Poconos area. USA has in the past twenty years represented such noteworthy and award winning builders as Westwood Contruction, Camelback Ski Corporation, Big Pocono Development Company, and been the exclusive agents for Colonial Glen Development and For Birch Acres (in it's final stages of development). Principles have been actively involved in marketing or building in the following neighborhoods: Snow Ridge, Lake Naomi, Timber Trails, Locust Lakes, Arrowhead lakes, Big Bass Lake, Birch Acres, Buck Ridge, Conashaugh Lakes, Craigs Meadow, Deer Track, Fawn Ridge, Saw Creek, The Hamlet, lake Valhalla, Ledgewood, Mt Crest Acres, North Park, Northridge Station, Pine Ridge, Pocono Haven, Pocono Highland Lake Estates, and over 30 more.